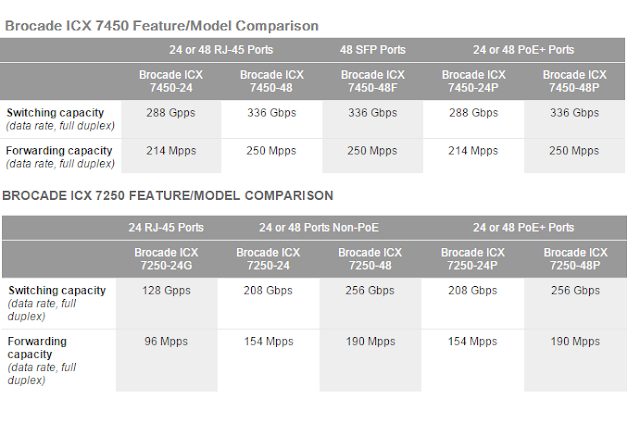 Have you guys seen the newer Brocade 7250 and 7450 switches? They are looking pretty decent in the performance spec area. Its looking to me like I will be replacing the 64XX series access switches with these guys when appropriate. Don't get me wrong, I'm not sad with the 6450s. Take a look at the backplane and forwarding specs here below. These are pretty good for access closet switches. I think I personally will be preferring the 7450s over the 7250s. But the 7250s still look really good for areas you need POE in the closets. I think the only one I might try to stay away from is the 7250-24G, but still its better than the Cisco 3850 24 port series when it comes to performance.